Well this is convenient. The University of East Anglia's Climatic Research Unit has made its global temperature data available for Google Maps. Dubbed "CRUTEM4," the data allows Google Maps users to monitor how surface temperatures have changed over time, both globally and locally. 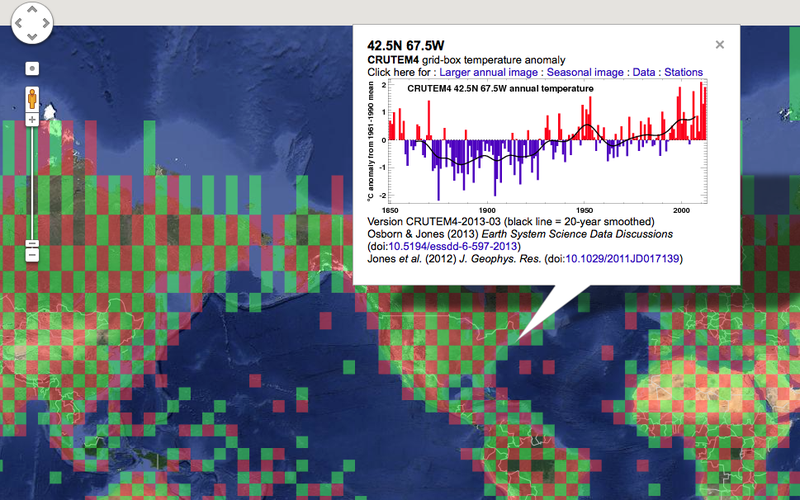 CRUTEM4 calculates what's called a global mean land surface temperature. To do so, it divides the Earth's land areas into equally sized grid squares. Using temperature data from monitoring equipment in each grid cell, an average temperature for the cell is calculated; these temperatures are then averaged across the globe to give a global mean temperature. (NB: If you're looking for the data Randall Munroe used, specifically, i.e. the charts that track the number of frigid nights in specific cities since the 1970s, see this collection of charts over at Climate Central.) More info – including how to DL the CRUTEM4 dataset and explore it in Google Earth – at Ars.